Emerging MRI technologies may cut the time to diagnose ALS in half enabling people with ALS to enroll more quickly into clinical trials. Imaging ALS. 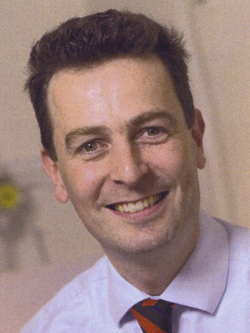 Neurologist Martin Turner MA PhD FRCP is developing MRI methods to diagnose and monitor ALS. Image: Courtesy of Martin Turner MA PhD FRCP. ALS is typically diagnosed within 12 to 14 months. But people with ALS do not have that kind of time to waste. Riluzole extends survival only 3 to 6 months. And, a growing number of clinical trials restrict participation to 24 months after the first symptoms appear - leaving people with ALS few opportunities to access potentially beneficial medicines to treat their disease. Some neurologists suspect, however, that this diagnostic delay might be cut in half by scanning the brain by MRI and looking for tell-tale signs of ALS. Combined structural and functional MRI methods according to recent studies can help distinguish ALS patients – at least from healthy people. And, MRS-based measures of certain neuronal metabolites might help identify people with inherited forms of ALS before they exhibit the first signs of the disease. What’s more, these techniques might help clinicians to more accurately diagnose people with ALS enabling better management of their disease. 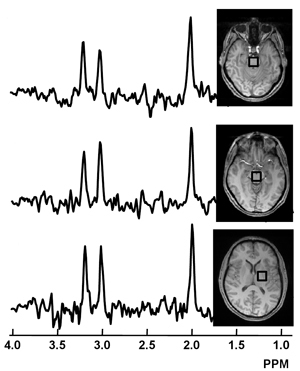 Certain structural MRI-based methods might help distinguish people with C9ORF72-linked ALS. Functional MRI measures might indicate certain cognitive challenges. And, certain structural MRI measures might help identify people with a rapidly progressing form of the disease. ALS Today's Michelle Pflumm PhD talked to University of Oxford neurologist and neuroimaging specialist Martin Turner MA PhD FRCP at the 2012 American Neurological Association meeting to learn more about MRI and its potential for people with ALS going forward. Can MRI be implemented today to help diagnose ALS? We have got lots of ways to separate patients from healthy people. But that’s not the question we’re asking in the clinic. We can see they’re not healthy. What we want to know is whether they’ve got ALS or perhaps something else. That’s the real question. Map quest. Researchers are charting the highways in the brain of people with ALS by diffusion tensor imaging in hopes to identify differences that could be used to diagnose the disease. Video: Eleftherios Garyfallidis and Ian Nimmo-Smith BA MSc PhD, University of Cambridge. What needs to happen to introduce these methods into the clinic? We have the candidates. We now need to translate them by taking people early in their workup - perhaps when they are first referred to electromyography (EMG). Some of them will have ALS and some of them won’t. If we scan people then, we can get a sense of how much it adds. EMG is probably our biggest competitor in terms of making a diagnosis. That’s our benchmark. No study to date has successfully used these methods to monitor people with ALS over the course of the disease. Why is it so challenging? It is what I call the inconvenient truth of ALS. When we are studying affected patients, what we are effectively seeing is an iceberg rising up out of the water. But what lies underneath, I suspect, is many years of accumulating pathology. It’s been building up for a long long time. I don’t think we are going to see a great change. It is hard to detect changes in an already damaged system. You recently kickstarted studies with University of Miami’s Michael Benatar MBChB DPhil to look for changes in people at high risk for developing inherited forms of ALS. Why? I think they’re the group that we need to focus on now. There might be signatures that are much more important in terms of capturing the essence of the disease. I think it will be possible to identify changes [in them]. In Alzheimer’s disease, we can pick up all sorts of changes in the brain 20 to 30 yrs before the disease. The bigger challenge is translating those changes to the 90% without clear genetic risk. Chemical imbalance? Researchers hope to zero in on chemical changes in certain parts of the brain using magnetic resonance spectroscopy to identify people likely to develop inherited forms of ALS and monitor their disease. Image: Govind et al. (2012), PLOS One. Do you think these studies will nonetheless help people with the sporadic form of ALS (no family history of the disease)? I think there is definitely great potential benefit. The biomarker signature that we find in a gene carrier without symptoms maybe what we can focus in on and look at in a patient in an early stage. This would allow potential drugs to be started sooner. Your most recent results, presented here at ANA 12, suggest that a routine type of MRI scan called FLAIR might also be helpful in identifying people with ALS – potentially enable more routine diagnosis of the disease. Can you tell us about that? We find that the FLAIR signal is certainly higher in the corticospinal tract of ALS patients and even higher in PLS patients. [The technique] might be helpful in providing objective evidence of upper motor neuron involvement, a cornerstone of ALS diagnosis. People with PLS often have to wait 4 years before being formally diagnosed. Do you think that this technique can help speed up this process too? Absolutely, with the caveat that it is not common. PLS is rare. Its only 3% of all cases. But it is important to study because it may help us understand how to slow ALS down. What needs to happen to put these methods into practice on clinical MRI scanners? The results are hinting that there is a lot of information encoded in a very routine scan which you can unlock using mathematical tools; software that’s been developed for non-routine scans such as diffusion tensor imaging. The next step is to take images from a clinical MRI scanner and see whether they give the same information. What do you think needs to happen to encourage neurologists to adopt MRI methods in general ALS practice? What we have to show is that they have unique value – that we can get someone in a trial sooner. I think that is pretty likely that they can deliver on that. To learn more about how neurologists hope to use MRI to diagnose and monitor people with ALS, read MRI, Make That A Double. To find out how neurologists hope to use MRS to identify people with inherited forms of the disease more quickly, check out NAA MaRkS The Spot.